Every Christmas my sons' school holds a craft bazaar for the children, and I use every spare moment in the weeks beforehand making things to sell. I try to come up with things that are quick to make, so they tend to be small with minimal sewing together. I use popcorn stitches to make legs, ears and even heads. I'm posting a few of the patterns here - feel free to use them for personal use or to make money for good causes. This turtle really is small - I don't have one to check with because they all sold, but I think they were about 1.5" across. They can be tiny toys, or turn them into keyrings. Small amounts of green (shell) and brown (body) yarn. Black yarn for eyes and mouth. 4 dc pop: popcorn stitch for legs. Work 4 dc into 1 sc, take hook out leaving loop, put hook through 1st dc & pull loop through. Round 1: Ch2, work 6 sc into 1st ch - 6 sc. Round 2: 2 sc in each sc around - 12 sc. Round 3: [2 sc in next sc, sc in next sc] 6 times – 18 sc. Round 4 - 5: (2 rounds) Sc in each sc around - 18 sc. Ss and change to brown yarn. Round 6: BLO Sc in next 2 sc, 4 dc pop in next sc, sc in next 3 sc, 4 dc pop in next sc, sc in next 2 sc, [head: 3 dc in each of next 2 sc, take hook out leaving loop, put hook through 1st dc & pull loop through. ], sc in next 2 sc, 4 dc pop in next sc, sc in next 3 sc, 4 dc pop in next sc - 17 sc. Round 7: [Sc in next sc, sc2tog] 3 times, sc in next 2 sc, [sc2tog, sc in next sc] 2 times – 12 sc. Round 8: [Sc2tog] 6 times – 6 sc. FO, leaving a length of yarn. 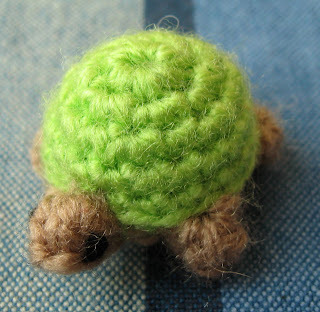 Use black yarn to sew eyes and a tiny mouth on the turtle's head, stuff and use length of brown yarn to sew up hole at bottom. Dear Lucy, thanks for sharing this. I've been looking for an easy (and free) pattern to follow for giveaways to my daughter's kindergarten class; they studied real turtles this year and loved it. I'll email you again when I'm done so you'll see how it turns out. Thank you - I'd love to see them! I have a site too, but I'm french. 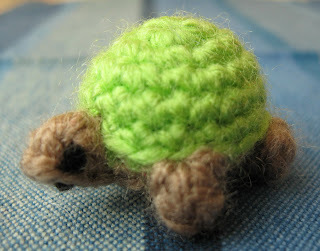 I showed my turtles and I translated your pattern in French on my site (http://boutsdefils.over-blog.com/article-les-mini-tortues-au-crochet-72094906.html and http://boutsdefils.over-blog.com/pages/Minitortues-5015846.html), with f course a link to your website on each page of mine. I hope you're ok ! Thanks Freckles, your tortoise is really cute! Bonjour boutsdefils! Your tortoises are so tiny, and I like the colours. It's very cool to have my pattern translated to French, thank you! Thank you ! I'd like to try this pattern. Thank you for all of your teeny tiny critters. They're fantastic. Hi LucyRavenscar! I noticed you turn your dolls into keyrings by adding a crochet chain on top of the doll and was wondering how you added the chain on. Hi! I usually leave a good length of one of the yarns I'm using (in this base the colour of the shell) when I cut it. I sew it through to the outside and sew a loop to put my hook in. Then I crochet a short chain, fasten off, thread the split ring on and sew the end of the chain back into the same place it started. 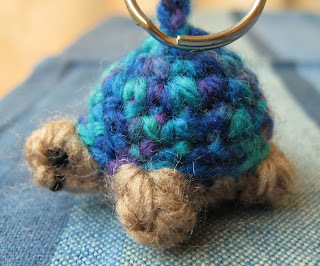 Alternatively, check out the Tiny Two-Tone Turtle pattern (http://lucyravenscar.blogspot.co.uk/2012/04/mini-crochet-creatures-tiny-two-tone.html) where you can add the split ring to the tail as you make it. Your little animal patterns are AWESOME!! They are well written and easy to follow. I have made the elephant, sheep and turtle they are so very cute. LOVE THEM!! Will you be making a giraffe? Thank you! I have a few patterns that I haven't posted yet, I must get round to it. I haven't done a giraffe, it sounds like a good idea though. I made a bunch of these animals for a Noah's ark set for my church's auction this summer, and I just happened to make some giraffes. :) I need to write down the pattern. But I can let you know when I get it all down. Thank you so much for your adorable patterns! Brilliant! I'd love to see photos, and it would be great to share the giraffe pattern. You said feel free to use your free patterns for personal use or raising money for a good cause. A little over a year ago I began my own little crochet business. I'd always enjoyed using your mini animal patterns, and they have been what I sold most of. I donate a percentage of everything I make to a good cause (right now it's to fight child trafficking in Thailand), and overall, my profits are being saved up to help me go into Missionary work. However, not all of it goes directly to that. This has really been weighing on my conscience lately, but I just hadn't gotten around to contacting you about it. I sell some of the animals I make from your patterns on Etsy, and right now I'm going to add a link to your blog here. (Although I never had claimed to make the patterns, I didn't give you the credit deserved). Please forgive me if you'd rather your patterns not be used in this way. If you want, I can pay you something for using the patterns I've used, and I can stop selling sheep and turtles and octopi if you want as well. However, if it isn't that big of a deal, and I can continue selling them (now giving you the full credit), then I am very very grateful for your patterns. They've helped me learn many of the basics of making my own patterns and doing amigurumi. Velvet Raven, that's a great idea! Alyssa, that's all fine, I'm happy for people to make and sell items made from my patterns, especially the little ones - they can be great to raise a bit of money for charity. If you can credit me as the designer, and link to the pattern if you're selling online, that would be great. Oh wow! This, and the pig and elephant, are amazing! I love that they're so small you can hardly photograph them, and the thread you've used looks really nice. Do you mind if I share these on my Facebook? Hi, you have amazing patterns. I was wondering if finished products made from your patterns can be sold?